Qari Hussain Mehsud, the late Taliban leader Baitullah Mehsud's cousin who heads the Fidayeen-e-Islam, has warned of a new wave of suicide attacks in Pakistan. Speaking to rediff.com from an undisclosed location via satellite phone, Qari Mehsud said: "A new series of suicide attacks will take place soon. The strategy is almost complete. The focus of the attacks will be once again on the military and other sensitive installations of the government." 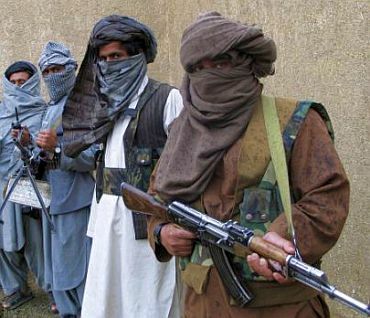 Reflecting on the recent wave of US drone strikes that has rattled the insurgents, the Taliban suicide squad chief declared that the Tehrik-e-Taliban Pakistan is strong, but it has shifted its policy to carrying out a guerrilla war, which is a key to success. Qari Mehsud has for long avoided media focus. Some time ago, a section of the media had reported his death in a drone strike in South Waziristan. But his name cropped up again after a series of bombings in Pakistan's provinces. "The fidayeen have recently carried out successful attacks in Punjab. I pay tributes to them for sacrificing their lives for a noble cause," Qari Mehsud said. "We have a large number of suicide bombers around who could rock the country," he added. "The attacks will be carried out across the country, but the focus would be on Punjab where policies are made -- attacks inside Punjab have more influence than in the rest of the country." Last week Pakistan Punjab Chief Minister Shahbaz Sharif controversially requested the Taliban to spare the province from terrorist attacks, saying Punjabis are against America's polices. Referring to the ongoing military operations in tribal areas, Qari Mehsud said, "The Taliban are focussing over guerrilla warfare. The media is also carrying one-sided stories; the Taliban are very strong in Waziristan and Orakzai." "Hakimullah Mehsud is alive," he claimed. "It was the Shura's decision to keep him away from the media. Now, as the situation demands, he will soon be brought before the media."